In 1934, Frank and Charlie Helms, the “Helms Brothers”, founded what is today Helms Bros. in Bayside as a Studebaker-Packard dealership. When Studebaker-Packard acquired the distribution rights for Mercedes-Benz in 1957, Helms Bros. became one of the first Mercedes-Benz dealerships on Long Island. Some years after the demise of Studebaker-Packard, the current owner of Helms Bros., Douglas Callahan, and his father purchased Helms Bros. from Frank and Charlie in 1977. Doug’s first position at Helms Bros was washing cars. He’s seen how technology and people’s needs have grown more complex over the years, but the Helms Bros’ philosophy has remained consistent: treat people with respect and dignity while fulfilling their automotive needs and desires. Today’s automotive experience includes all the luxury and convenience one expects with Mercedes-Benz. 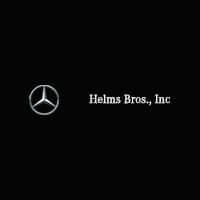 Helms Bros has a “split” facility; the showroom in Bayside is dedicated to the sale of New and Pre-owned Mercedes-Benz, and a separate facility in Flushing specializes in servicing Mercedes-Benz of all ages. We pride ourselves on accommodating your needs and desires on your terms. Prefer to have a sales consultant visit your home or office – no problem. Need a ride somewhere or a Mercedes-Benz to drive while yours is being serviced – our pleasure. Our sales consultants and service advisers speak multiple languages for clear, efficient communication with everyone. Helms Bros is honored to share its success with the community. Some foundations and charities we have supported recently include Bayside Little League, St. Jude Children’s Research Hospital, North Shore Animal Shelter, Leukemia and Lymphoma Society, March of Dimes, Cancer Research Institute, Young People’s Day Camps, Special Olympics New York, Susan G. Komen Breast Cancer Awareness Foundation, Local Food Bank, and New York Cares Coat Drive. If you have a favorite charitable organization that you think we should consider, please let us know.